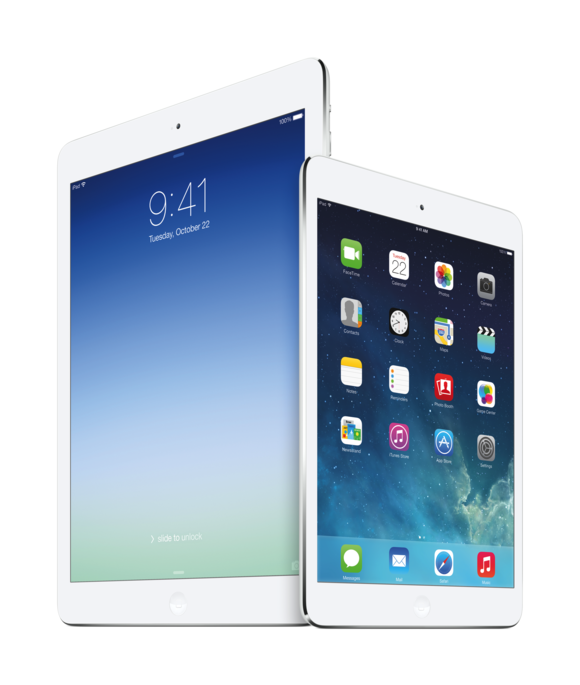 Apple introduced the fifth generation of its full-size iPad on Tuesday, renaming its tablet the iPad Air. The new offering bumps up the speed and performance while slimming the bezels to give the iPad a sleeker look. The iPad Air sports the same 9.7-inch Retina display as its full-size predecessor, but it has a much smaller bezel around the screen—43 percent thinner than the previous generation, according to Apple. Overall, it’s 20 percent thinner than the fourth-generation model. And at one pound (down from 1.4 pounds), it’s lighter than before as well. The iPad Air (left) next to the new iPad mini. The iPad Air (introduced along with the new iPad mini with Retina display) incorporates the new 64-bit A7 chip first seen in the iPhone 5s, with the same M7 coprocessor. Apple says the new processors deliver twice the CPU and graphics performance as the iPad with Retina display that came before it—all the while retaining the tablet’s 10-hour battery life. Unlike the iPhone 5s, however, the new iPad doesn’t have a Touch ID fingerprint scanner. The iPad Air also takes advantage of faster 802.11n Wi-Fi thanks to MIMO (multiple in, multiple out) support with multiple antennas. It also has expanded LTE support for more countries around the world. Apple also touted both improved FaceTime (front) and iSight (rear) cameras, plus the addition of dual mics for better Siri and audio capture. Both Wi-Fi and LTE models of iPad Air will start shipping November 1 in 42 countries. It will be the first iPad launch ever where China will be included in the first round of rollouts (though customers in China, Hong Kong, and Macao will only be able to order the Wi-Fi version). The Air will come in silver/white and space gray/black color choices, costing the same as the iPads it replaces. For Wi-Fi models that’s $499 (16GB), $599 (32GB), $699 (64GB) and $799 (128GB). For Wi-Fi + Cellular models, that’s $629 (16GB), $729 (32GB), $829 (64GB), and $929 (128GB). The iPad 2 remains in Apple’s lineup at $399 for a 16GB Wi-Fi version. Apple also announced new cases for the iPad, at $39 for polyurethane and $79 for leather, including Product Red versions of each. 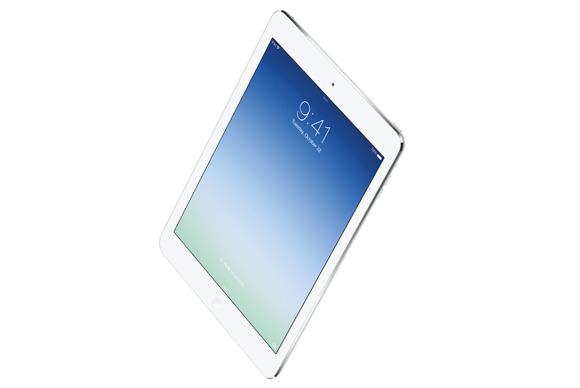 The iPad Air is still an iPad, but it’s lighter and thinner, and twice as fast to boot.